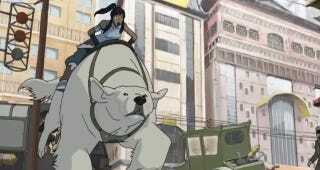 Scenes from the upcoming Avatar: The Legend of Korra are coming out in dribs and drabs — take a look here if you haven't seen them — but we're never ones to complain. The latest tidbit picks up where the last clips left off. A group of Metalbending police officers have come to arrest Korra for disrupting the peace after she clobbered some hoodlums. The video quality isn't spectacular, but we won't be churlish about sneak peeks. The series will air sometime this year. Hat tip to Syafiqjabar of Mars!